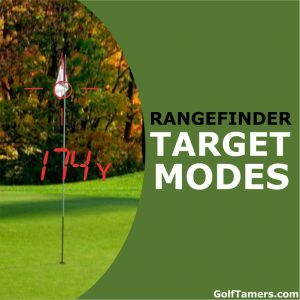 Home » Guides » Rangefinder Target Modes – How Can They Benefit Your Golf Game? When you’re out putting on the green, there’s only one thing you need from a rangefinder – the distance to the hole. With all the different features and target modes available at just the touch of a button, how do you know which ones will be useful and which ones you just simply will never use? Can different target modes in a rangefinder replace the need for a caddie? Well, I’m proud to tell you that you’ve come to the right place if you want to know how to maximize the most use from your target modes to benefit your golf game. First of all, this article relates to laser rangefinders and not GPS golf rangefinders. GPS units use satellite signals to acquire distances which eliminates the need for different target modes. Nevertheless, all rangefinders provide the very basic and simple line of sight distance to your target which is usually the hole. To improve measurement accuracy in laser rangefinders, you can also have different target modes that can help you zero into the flagstick, ignore water droplets, and can even adjust for inclines and declines that can affect your distance to the hole. 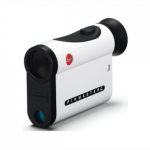 All golf laser rangefinders use a first target priority mode to get the most accurate distance to the target. It ignores background objects like trees, mounds, or anything in the distance that can serve as a distraction to successful target acquisition. By firing the laser in first target priority mode, it will search for the nearest target and provide you with the nearest distance. In golf, this is the most helpful target mode since that nearest distance is usually the flagstick. Most of the different golf rangefinder manufacturers upgrade their first target priority mode to have specialized abilities. Each brand has their own name for this technology, such as Laser Link’s AccuFlag, Bushnell’s PinSeeker, and Leupold’s PinHunter modes. These pin seeking modes are especially worth investing in because they can make ranging for that flagstick even more faster and accurate than before. They’re designed to specifically seek for and zero onto the flagstick while in first target priority mode. Furthermore, sometimes these modes can be enhanced to provide a confirmation that it’s locked onto the flag, such as a vibration like Bushnell’s Jolt series or an audio tone like Laser Link’s rangefinders. If you’re the type that sometimes doubts your distance readings while ranging, you’ll definitely love the confidence you’ll get when taking advantage of a specific pin seeking mode. This is sometimes referred to as second target priority mode. 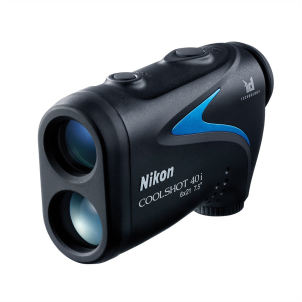 Hunting rangefinders use this mode as the standard target mode, but in golf, not so much. It works by ignoring all foreground distractions to acquire the furthest distance. When playing golf, the idea is to get the distance to the hole, and this is usually the closest distance, not the furthest. But, it sometimes helps to have this feature so that you can range out to any target you want, making it a versatile device. If you have this target mode, you could probably get away with using it for more activities than just golf, perhaps hunting or bird watching. If this is a mode that you’d like to have as an extra bonus, consider the Nikon COOLSHOT 40i that allows you to toggle between First and Distant modes. This mode is super convenient and you shouldn’t be without it if you’re going to have a rangefinder at all. While hunting, you’re more likely going to use it for a continuous update of distances on a moving target like a deer. But, for the beloved game of golf, you’ll want to use it on a moving target like the golf cart of the competing team in front of you. All kidding and hostilities aside, if you want to quickly evaluate distances of a certain area on the course, there’s no need to hit and trigger each target or landmark one at a time. Scan mode takes all the finger work out for you so that as you pass over stationary or moving targets, you’ll see the distances updated on the viewfinder. Having scan mode is part of a standard for all hunting rangefinders, so you’d assume the same for golf rangefinders too, right? Well, not so true. Although Bushnell’s newest line of golf rangefinders have ditched the dedicated automatic scan mode, GolfBuddy’s Laser Rangefinder has improved scan mode ease of use. Traditionally, you’re supposed to keep the firing button depressed to stay in scan mode. However, GolfBuddy made it even simpler by being able to activate a 10 second scan mode with just one push – no depressing. In the game of golf, scan mode gives you a full distance report in just one pan of the course. It’s too convenient of a feature to pass up. This feature is more likely to throw the cost of your $100 rangefinder up another $50 to $100 and more. Like the other modes, it acquires a distance to the hole, but it will also take into consideration the degree of any incline or decline on the course that can affect that distance. While many golfers find it very handy to have in practice or leisure rounds, it’s considered an “illegal” feature by the USGA to use in tournament games, even asking your caddie for advice isn’t allowed either. These non-tournament legal slope modes can get even fancier by providing advice on what club to use and when, and they can also factor in altitude, temperature, and any other conditions that can affect your hit. Can your caddie do all that? 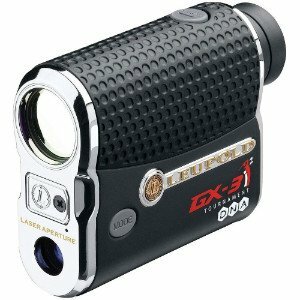 The Popular Leupold GX-3i2 features Fog Mode to range through tough weather. Not all manufacturers build their rangefinders with the ability to cater for wet or foggy weather. And, if you’re a golf addict, you’ll know that rain clouds don’t care if you’re out on the green or not. This leads us to ask the question, is fog or rain mode beneficial to golf or is it just another fancy feature you won’t really care for? Well, don’t get too cheap or skeptical just yet. Rain particles can interfere with the quality of ranging since water droplets can refract the laser emissions from the rangefinder, which ultimately prevents it from acquiring accurate distances. But, if the rangefinder has this override technology, such as a fog mode or rain mode, to still obtain an accurate and true distance, then it would be worth every penny you spent on it. Leupold has their smart Fog Mode, Bushnell has their Rain Mode, and Simmons has their built-in rain and reflector targeting mode. As a fellow golfer, you should know that not every day is a sunny day while on the course. Rangefinders are quickly becoming the cheap and effective way to replace your book-carrying caddie. With all these target modes to help you make sure that you get the most accurate distance to the hole, what else is there to want? Perhaps one that can automatically order you up some iced tea and a towel at the end of a game. Hmm, maybe you should hang on to that caddie of yours. In the end, a rangefinder that gets you a true distance to that pin in rain or shine, whether it’s from first target priority mode or even scan mode, is one worth keeping. Can you say the same about your caddie?